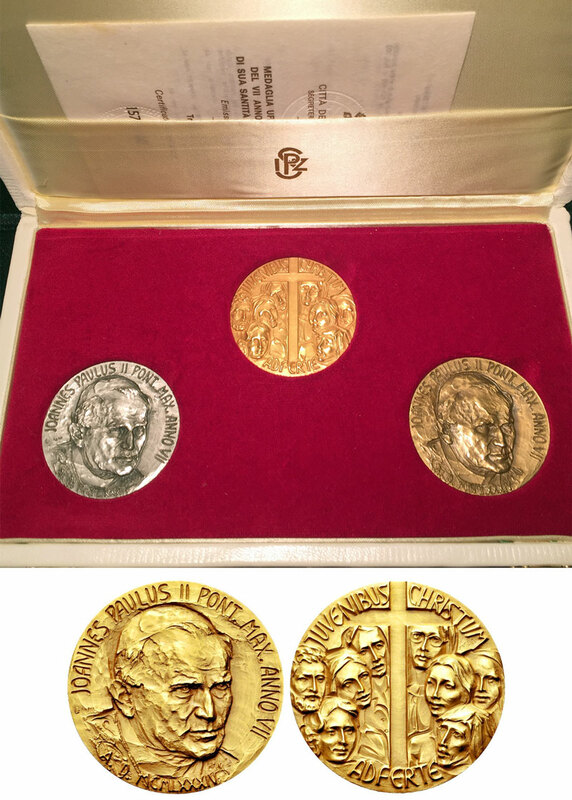 Official Vatican medals, anno VII (1985) of Pope John Paul II, in gold, silver and bronze to mark the closing of the Holy Year of Redemption 1983/84. Obverse depicts the pontiff while the reverse depicts a cross at the center with groups of people of various nationalities to either side. From Vatican City's official announcement of the medal: The Pope has entrusted the Cross of the Holy Year to the young by inviting them to bring it to the world as a sign of the love of the Lord Jesus for humanity and to announce to all that only in Christ who died and rose again is there salvation and redemption. Each medal is 44mm in diameter. Gold medal is .917 fineness and weighs 55 grams. Includes original plush case and certificate. This is set number 157 out of 900.